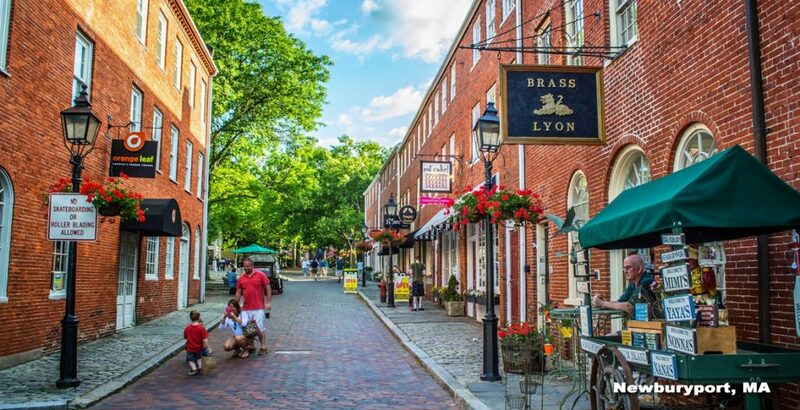 It’s an honor to be taking part in this celebration of readers and writers in the beautiful town of Newburyport, MA, north of Boston on April 26-27. The Literary Festival opens on Friday, April 26, with a DINNER WITH THE AUTHORS at 7:30 p.m.
1:00 PM When One is Not Enough: Why historical-fiction series keep us coming back for more! Join a discussion by three award-winning historical novelists on the art of writing a series. Whether it’s one character’s journey in several books as with Patricia Bracewell’s Emma of Normandy trilogy; different characters’ perspectives from the same York family in Anne Easter Smith’s series set in the Wars of the Roses; or the intrigues of Donna Russo Morin’s fascinating women artists of 15th century Florence in her Da Vinci Disciples trilogy, crafting a series can be fun but complex. Each book must stand alone and yet a reader should want to pick up the next one. There will be over 60 authors taking part in the Festival, with panels and readings ongoing on Saturday, Feb. 27, from 9:00 a.m. to 4:00 p.m. You can see the full schedule HERE. I can’t think of a better way to spend a spring weekend! King Harold I. 13th century. British Library. That rabbit looks nervous. 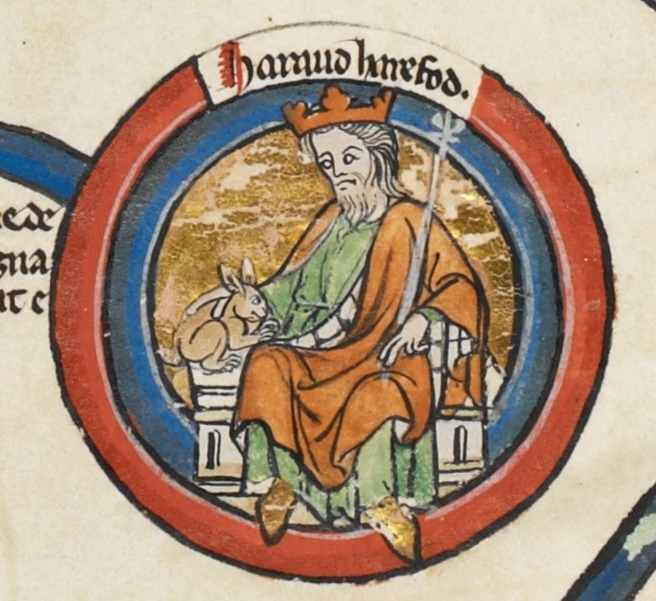 The first king of England to be named Harold (there would be a second Harold, whose reign was even more brief but who is far more famous) died on March 17, 1040 at the age of about 25. His by-name, which has stayed with him to this day, was Harold Harefoot. Harold was the son of the Danish King Cnut and his English concubine Ælfgyfu of Northampton. His parents’ union took place in England some years before Cnut captured the English throne in 1016. Harold was their second son, probably born in Denmark in about 1015. 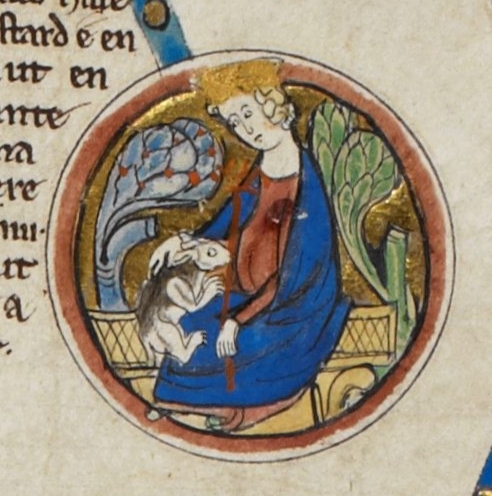 Harold earned his by-name by scooting from somewhere in northern England to Oxford quick-like-a-bunny to present himself to the witan soon after his father died at Shaftesbury in November, 1035. Claiming that he was Cnut’s son, and presumably with his mum at his side to certify it, he demanded to be designated king of England as his father’s heir. His claim, according to the Anglo-Saxon Chronicle, was incredible to many, but the Chronicle doesn’t say why. Was it incredible because he had never been seen at court so no one knew of his existence? Was it because he had never been given any responsibilities by his father and so was considered inept? 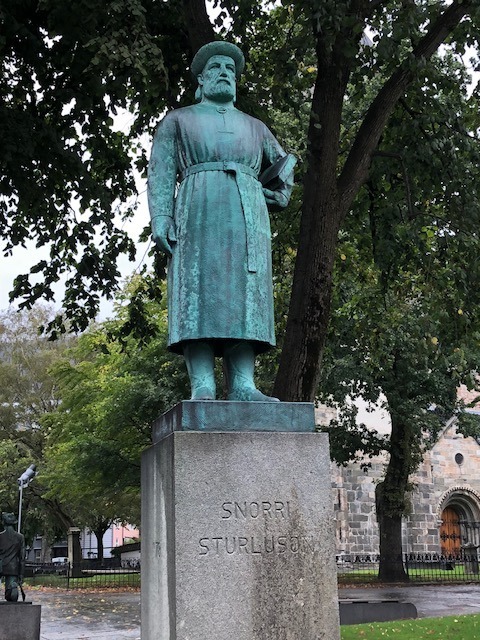 After all, his older brother (Swein, who died at about this time) had been sent to rule Norway, and his younger half-brother was king in Denmark. Or was it incredible because many people believed the story that he wasn’t really Cnut’s son, but the child of a servant that Ælfgyfu had passed off as hers and Cnut’s? 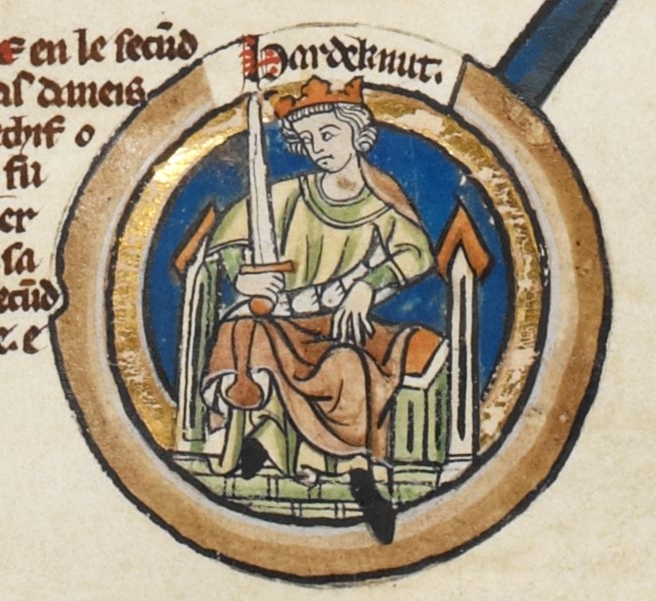 In fact, there were three other men who could have claimed the English throne at Cnut’s unexpected death, but Harold was the only (presumed) son of a king in England at the time. Harefoot got there first. The man that the witan wanted to put on the English throne was Cnut’s son by Queen Emma, Harthacnut. But he was in Denmark fighting off a Norse army and couldn’t get to England to stake his claim; it was obvious to the witan that he might be a while and that someone had to govern until he arrived. Queen Emma and her close supporter, the powerful earl Godwin, offered themselves as regents for the absent Harthacnut. But Harald had allies who argued against that. Some of them were likely his mother’s northern kin. Others were northerners who were Godwin’s rivals and who considered Godwin already too powerful. The leaders of Cnut’s fleet, too, argued for Harold. Historian N.J.Higham suggests that they might not have wanted to see a Dane land in England with his own fleet that would put them out of business. In the end, a compromise was reached: Harold would “hold” England for himself and his brother. Queen Emma, with Godwin’s support, would “hold” Wessex for Harthacnut. What must have stuck in Harold’s craw was that Emma, in Winchester, also “held” the royal treasure. According to Emma’s Encomium—an account of events written at her behest about six years later—Harold wasn’t happy just ruling in the north. He wanted all of England (and, no doubt, Cnut’s treasure.) He summoned the Archbishop of Canterbury and demanded to be crowned. 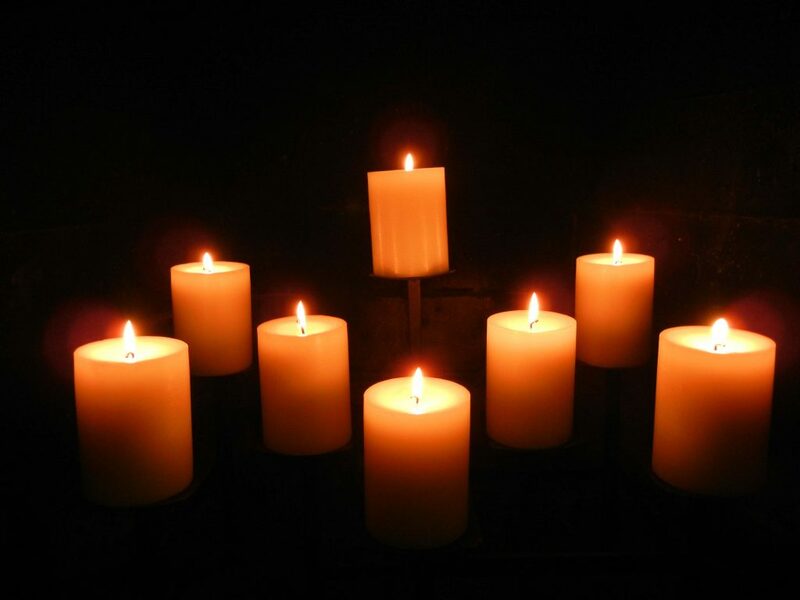 The archbishop refused to do it as long as Emma’s sons lived. He put the crown and the scepter on the altar (in Canterbury, presumably) and forbid any bishops to remove them or to consecrate Harold. Unable to act openly against Emma, in the months that followed Harold used bribes and threats to secure the allegiance of the great men of England. One of them may have been Godwin because he was deeply implicated in what happened next, involving the other claimants to the English throne, Emma’s sons by her first husband, King Æthelred. Back in 1016 when Cnut conquered England and married their widowed mother, Edward and Alfred had been sent to their uncle’s court in Normandy. Queen Emma entrusts her sons to her brother, the Duke of Normandy. The Life of Edward the Confessor. Cambridge. They were still in Normandy in 1036 when Harold was ruling in London, Emma was in Winchester waiting impatiently for Harthacnut, and historical events began to get historically murky. In any case, they came. Edward (age 30) sailed to Southampton, took one look at the bristling army waiting to meet him, and turned straight around and sailed back to Normandy. Alfred (age 24) sailed from Flanders and when he made landfall was met by Godwin, his mother’s supporter, someone he could trust. Godwin, though, was already following orders from King Harold. We know this because he would claim it in his defense some years later when he was tried for his involvement in this affair. He delivered Alfred and his company to King Harold’s men who proceeded to brutally murder most of Alfred’s companions. Alfred was taken to Ely where he was given some form of trial, blinded and then murdered. There is an aspect of Alfred’s death that I have not seen mentioned anywhere in my research, and I am surprised by its absence. King Harold had two uncles–his mother’s brothers—who were blinded by Alfred’s father, King Aethelred. In that same year Harold’s grandfather, Ælfhelm, was murdered on Æthelred’s orders. It is hard for me not to see the vengeful hand of Harold’s mother in the blinding and murder of Alfred. And with an unmarried Harold sitting on England’s throne, the queen at his side, counseling him, would be his mother, Ælfgyfu, eager for a long-awaited revenge. In 1037, Harold moved against Emma. As the mother of Alfred, who had been tried and executed for attempting to unseat King Harold, she would have been implicated (because of that letter) and so she was driven out of England—in the winter, we’re told, so probably in January or February. Harald finally got his hands on Cnut’s treasure! (What reward did Godwin get, I wonder.) Harold was now king of all England. Perhaps he was even crowned, but his reign was short—four years and sixteen weeks, dating from the death of his father. His only recorded act, aside from the murder of Alfred, was to send troops to punish the Welsh for border raiding. The Welsh responded by pummeling the English, which did nothing for King Harold’s reputation. Harold Harefoot. 14th c. British Library. Note, crown & scepter. Bunny looks happy. By the end of 1039 King Harold might have been ailing, although from what, it is impossible to know. (It’s interesting that all of Cnut’s sons died of natural causes in their mid-twenties, and that Cnut’s brother died young as well. Some genetic weakness?) Harthacnut had resolved his problems in Denmark and by early 1040 had raised a fleet and sailed to Bruges to consult with Emma, prepared to invade England. When Harold died on March 17, 1040, English emissaries went to Bruges and offered the throne to Harthacnut. One of his first acts as king was to disinter his half-brother’s body, behead it, and toss it into a fen—vengeance taken on one half-brother for the murder of another, Alfred. Emma of Normandy, Dowager Queen of England, died on 6 March, 1052, in Winchester. She was only the second woman to be crowned queen of all England, and the only woman ever to be crowned queen of England twice. For 50 years, through the reigns of her two husbands, her two stepsons and her two sons, she was a significant figure in English politics. 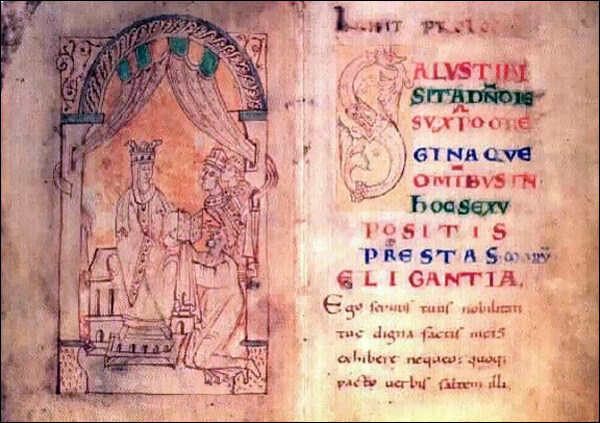 Her first marriage in 1002 was to King Æthelred II—a widower with 10 children, several of them adolescent sons who must have been more than a little alarmed to see dad take a new bride who was young enough to be his daughter and who would likely give him sons to one day vie with them for England’s throne. On Emma’s arrival in England, she surely had to negotiate some thorny family relationships at the same time that she was learning to navigate the sometimes deadly interplay between the king, the nobles, and the ecclesiastics who jockeyed for power in 11th century England. And, along with everyone else, she had to avoid the marauding viking armies who regularly ravaged the kingdom. A modern interpretation of Queen Emma from my novel The Price of Blood. The years of that first marriage could not have been easy ones for the young queen, but Emma was well prepared to face them. She appears to have been a polyglot who spoke Norman French, had probably learned Danish from her mother, and no doubt picked up the English tongue quickly if she didn’t know it already. There is evidence that she could read Latin, which was the language of literature and law in England and the rest of Europe. Before she was 20 years old, she was a wife, a queen, a stepmother, a mother, a landowner, a patron of the church and the arts, and the manager of a vast household. By 1013, though, with England at all-out war against the invading Danish king Swein Forkbeard–and losing–Emma was forced to abandon her many English properties (and their incomes) and flee to Normandy with her children. There she persuaded her brother, Duke Richard II, to offer refuge to her husband and his court when no one could possibly have estimated how long such an arrangement might have to last. Once again there must have been some family tensions to navigate. 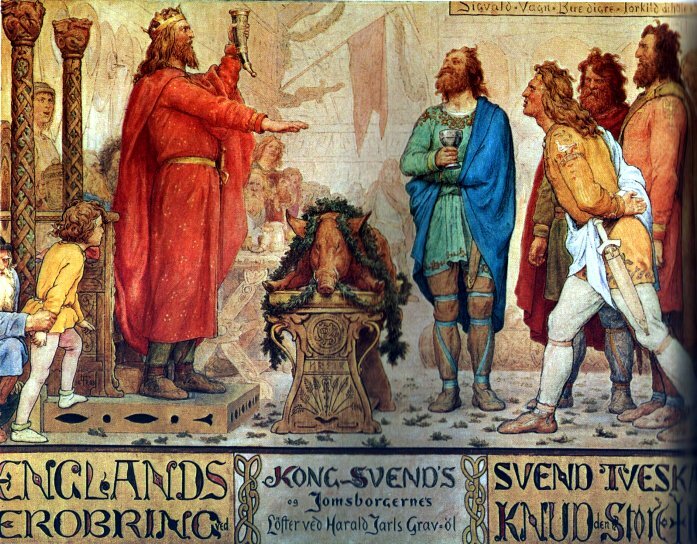 Swein died suddenly, though, in early 1014 and Æthelred, invited back to England, ousted Swein’s son Cnut and the remnants of his viking army that were scattered all across the kingdom. Emma returned to England as well, but there were more trials to face. In 1015, while the king had some of his powerful lords murdered and his eldest son responded by rebelling against him, (more family strife–it never got easy), the Danish prince Cnut, determined to win himself a kingdom, returned with a massive army. In 1016, probably to no one’s sorrow, King Æthelred died and Emma’s stepson Edmund, now the king, took up the fight against the Danes. When Cnut laid siege to London, Emma was trapped inside the city, and there are indications that the widowed queen played a role in the citizens’ successful resistance, although we cannot be sure. Stories differ. What is certain is that her stepson, King Edmund Ironside, lost a major battle at Assandun in late 1016 and died soon after. When the dust settled, in mid-1017, Emma married Cnut, the victorious new king of England, and her second reign as queen began. 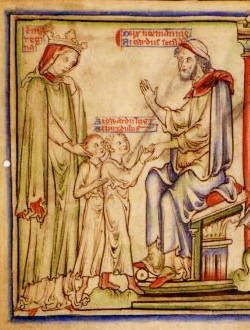 Emma made certain that her children by Æthelred—Edward (12), Godgifu (7), and Alfred (4), were given refuge in Normandy with her brother. As a result, the relationship between Emma’s children and their Norman kin would be very strong, and in 1066 their cousin William would use those ties to bolster his claim for the English throne, and we all know how THAT turned out. But that was way in the future—there would be 4 kings of England between the reigns of Cnut and William the Conqueror. As queen consort and advisor to Cnut, and as patron to churches and abbeys in England and in Europe, Emma was even more powerful during Cnut’s reign than she had been during Æthelred’s. According to Emma, it was a marriage of equals. Cnut’s hold on England was eventually secure enough that he could journey to Rome and lead armies in Scandinavia, leaving England in the hands of regents, one of whom was likely his queen, Emma. 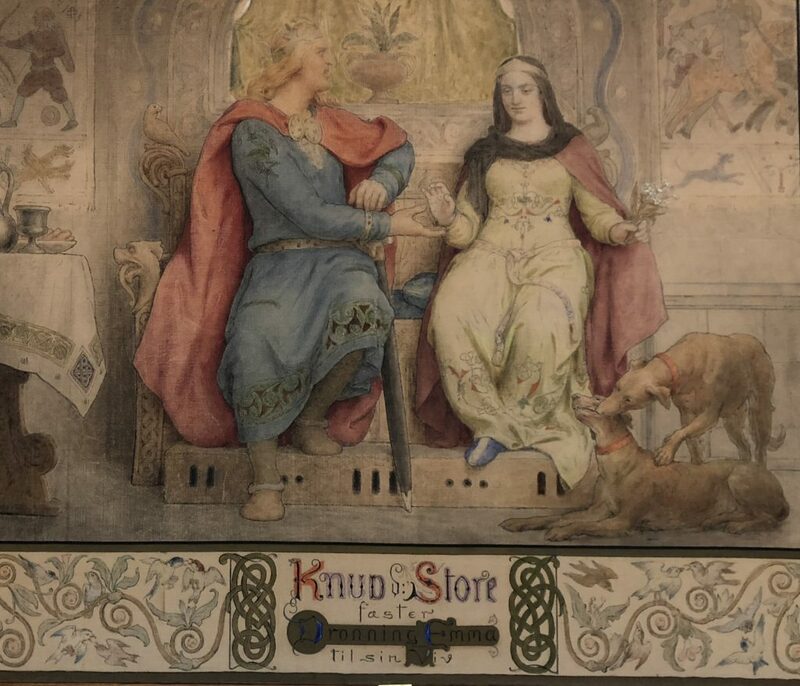 She and Cnut had two children: Harthacnut, who would become king of Denmark and England; and Gunnhild who would marry the son of the Holy Roman Emperor. Still, there must have been some tensions within the royal family itself. 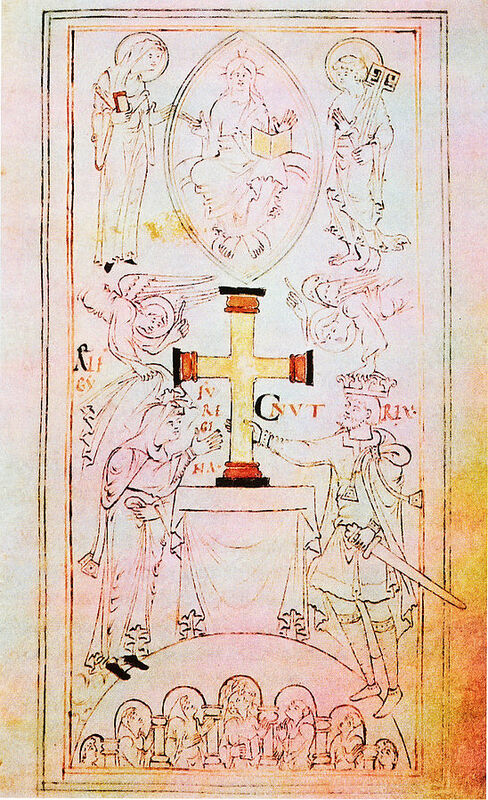 When Cnut married Emma he already had a wife, Ælfgyva of Northampton, who had given him sons and who was lurking somewhere in England or Scandinavia. Aware of this problem from the start, Emma demanded a pre-nup from Cnut guaranteeing that any sons she might have would be his heirs; but when Cnut, whose empire included both England and Denmark, died in 1035, the only one of his sons in England was Ælfgyva’s boy, Harold. Urged by his mum, Harold immediately presented himself as the claimant to Cnut’s English throne, earning the nickname Harefoot. Because Emma’s son, Harthacnut, was in Denmark preparing to defend it against imminent invasion by the Norse and the Swedes, the English magnates decided to divide England in half: Harald to govern north of the Thames, where his support base was, and Emma to govern as regent for Harthacnut in the south. To complicate things even more, Emma’s sons by Æthelred arrived in 1036 to stake their own claims to the throne, and the outcome was disastrous. Alfred was captured and killed by men loyal to Harold, Edward fled back to Normandy, and Emma was driven out of England by Harold, taking refuge with her noble kin in Bruges. Even in exile, though, Emma was working to place one of her sons on the throne of England. She summoned Edward and they discussed it, but his younger brother’s tragic fate at English hands convinced him that he wouldn’t have support from the English. In 1040 Harthacnut joined Emma in Bruges, fully prepared to make the attempt to oust Harold, his half-brother, from the English throne. Just as Emma and her son were about to lead an invasion force to England King Harold Harefoot conveniently died. 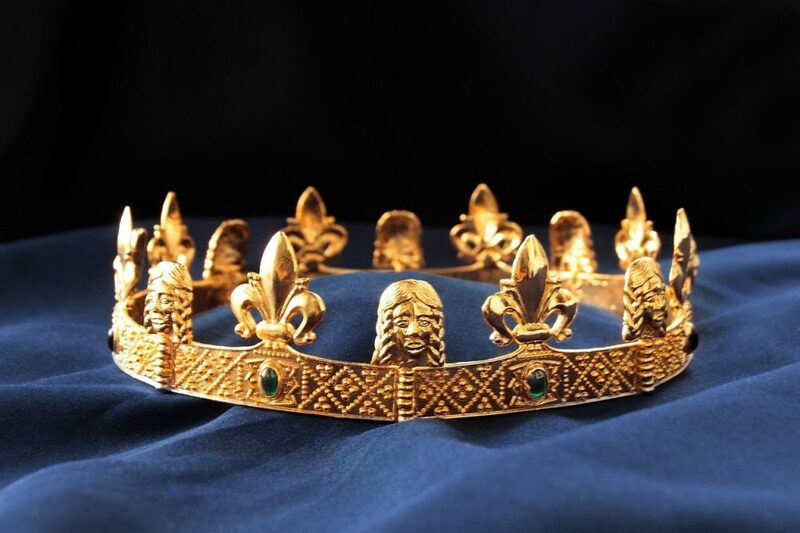 Harthacnut, age 22, claimed the crown of England with Queen Emma beside him to offer support and counsel. Emma was now mater regis, mother of the king, and once again a significant force in English politics. In 1041 Harthacnut invited his half-brother Edward to England from Normandy. This was probably Emma’s suggestion, and it may have been because Harthacnut was not well. For a time, Emma was once more a powerful political figure, second only to her sons. We know this because of her signature on charters and because she commissioned a book—a remarkable example of 11th century political spin that related events in England, from the war with Swein Forkbeard in 1013 to the beginning of Harthacnut’s reign in 1040, as Emma wanted them remembered. Known now as the Encomium Emmae Reginae, it might have been read aloud as entertainment at court, the Latin translated aloud into Danish, Flemish, French and Old English. Emma receives her copy of the Encomium Emmae Reginae from the writer as her sons look on. But in 1042 Harthacnut died, and Edward, almost 40 years old, became sole ruler of England. He did not want any help from his formidable mother, thank you very much, and it especially irritated him that mummy had control of the royal treasure. In 1043 he rode to Winchester to confront her, taking with him three powerful earls and a force of armed men. (Did I mention that Emma was formidable?) With their help he confiscated the royal treasure and divested his mother of most of her lands, ordering her to live a quiet life; for a while she did. But she was back at court in 1044, perhaps having persuaded Edward that he had been too harsh in his actions toward her. Eventually, though, her name disappears from the witness lists and it must be presumed that, after Edward married in 1045, Emma finally decided to step aside. (Two queens is always one too many. More family strife.) Maybe she hoped to retire and help raise the king’s children. If so, she must have been awfully disappointed when there weren’t any. Emma outlived all of her children except for her son, Edward the Confessor. She was buried at the Old Minster in Winchester next to Cnut and Harthacnut, and when that building was pulled down their bones were preserved with others in mortuary chests in Winchester Cathedral. In the past decade Queen Emma, for centuries relegated to the footnotes of history, has been re-discovered. Helen Hollick based her novel The Forever Queen on Emma’s life story. I built my Emma of Normandy Trilogy around her years as Æthelred’s queen. Now, British composer William Blows has written a symphony titled Queen Emma which celebrates her life. She is no longer a forgotten queen. And in Winchester, the bones in those ancient mortuary chests are being examined to see what DNA testing can tell us about the royals of Anglo-Saxon England, including the formidable queen, Emma of Normandy. 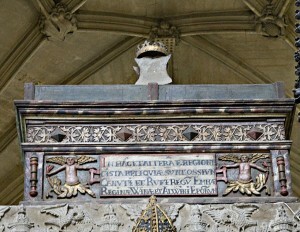 The mortuary chests in Winchester Cathedral. Despite the painting above of King Cnut wooing Emma of Normandy, this is not a love story. But it IS about Queen Emma and St. Valentine. Emma of Normandy, Queen of England, was long remembered as a generous patron by the churches and abbeys of York, Canterbury, London, Winchester and Bury St. Edmund, as well as foundations in Germany, Scandinavia and France. Patronage—the giving of gifts—was a way of exercising queenly power, and a queen’s gifts were much sought after. Emma’s gifts took the form of textiles, such as altar cloths adorned with gold and precious stones; of gold cups; of silver shrines; of beautifully decorated manuscripts; and, especially, of relics encased in lavish gold and silver coffers. One of the relics associated with Queen Emma was the head of St. Valentine who, it was believed, was martyred in Rome in the 3rd century, presumably on 14 February, which became his feast day. In 1042 Emma gave this relic of St. Valentine to the New Minster, Winchester, and it was cherished as one of the church’s most valuable possessions. This was long before St. Valentine’s Day was mentioned in Chaucer’s 14th century poem Parlement of Foules as the day when birds choose their mates, associating it forever with lovers, candy, cards, and flowers. But, you may ask, how did Emma come by the head of this beheaded saint in the first place? Well, at some time in the early medieval period, a Norman priest acquired the head of St. Valentine in Rome (possibly through nefarious means, it’s hard to say). He took it back to Normandy, to the abbey of Jumieges where he presented it to the monks and entered the monastic life there. In 1037 a close friend of Emma’s son Edward became the abbot at Jumieges, and in 1041 when this Abbot Robert accompanied Edward to England, he brought the relic with him. Either he gave it to the queen, or she purchased it from him. The following year, she gave it, in turn, to the New Minster at Winchester. 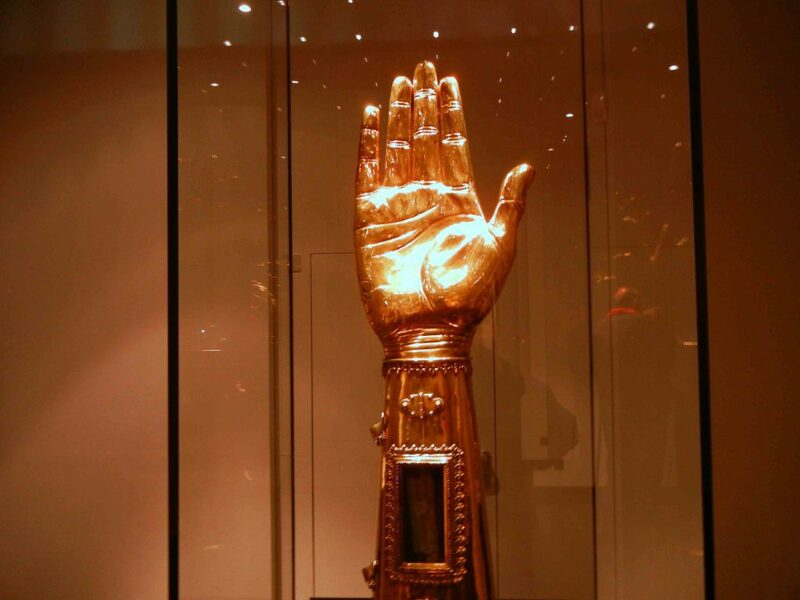 It was still there 75 years later when the reliquary was opened and the head was washed. When the New Minster was torn down in the 12th century to make way for a new cathedral, the monks moved into the nearby Hyde Abbey and they took the reliquary of St. Valentine and many others with them. The abbey, though, did not survive the Dissolution of Henry VIII’s reign, and St. Valentine’s head and reliquary are long gone. Nevertheless, some tangible evidence of this story remains. 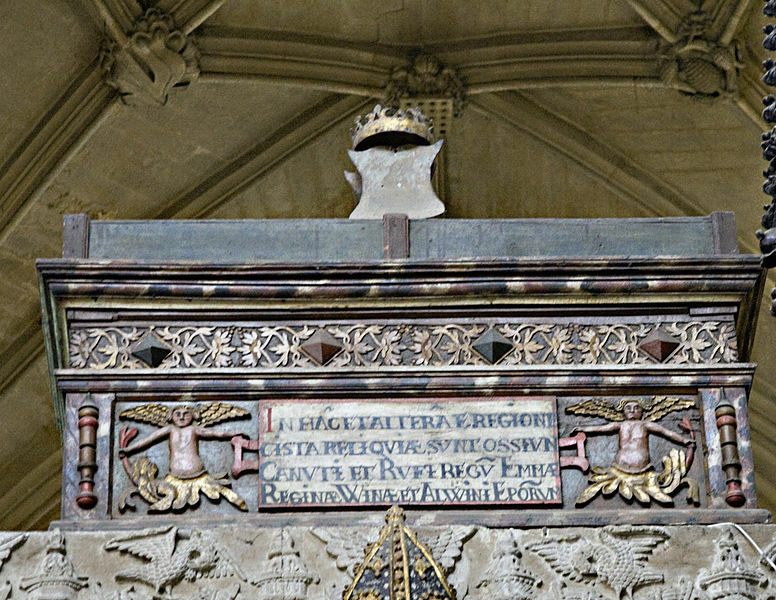 In Winchester’s beautiful Norman cathedral, the bones of Queen Emma and King Cnut are still preserved. I could not make it to London to see the highly acclaimed exhibit at the British Library, ANGLO-SAXON KINGDOMS, so I purchased the catalogue, which arrived yesterday. I have a lot of reading ahead of me over the next weeks as I delve into this background material about the hoard of marvels brought together from Italy, France, Sweden, the U.S., Ireland, the Netherlands, and all over Britain for this exhibition. The cover of the catalogue is a gorgeous reproduction of King Edgar’s charter for the New Minster, Winchester. I have seen photographs of many of the exhibit items over the years in the course of my research. A few of the actual items I have seen on earlier visits to the British Library where I stood and stared bug-eyed, for example, at a page of one of the Anglo-Saxon Chronicles or at the reddish, goatskin-covered, 8th century volume of the St. Cuthbert Gospel found in the saint’s coffin back in 1104. One item I had never seen, and never even read about before, is The Cnut Gospels. The manuscript was produced at some time in the early 11th century, and the first page of each of the 4 Latin gospels is gorgeously illustrated. 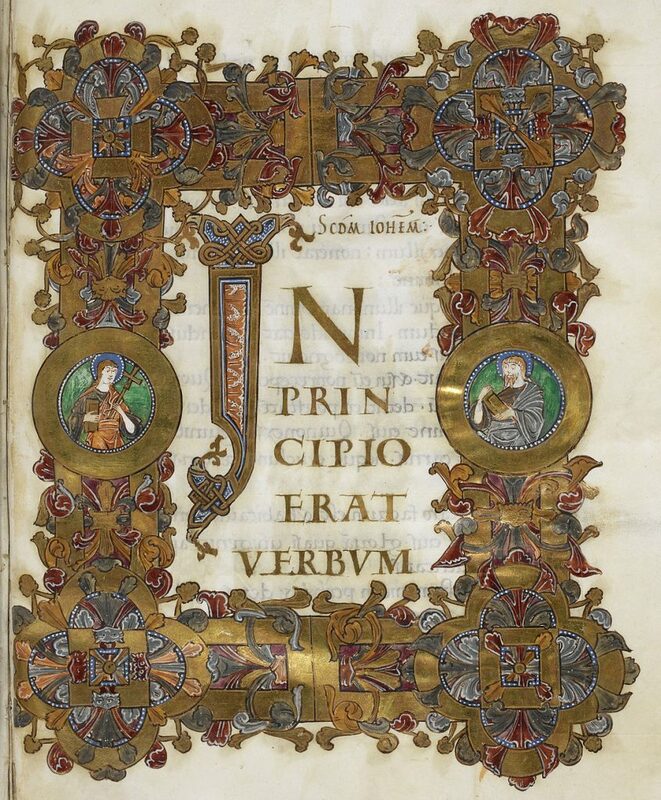 Above is the first page of the Gospel of St. John, decorated in gold. It is not the page, the Gospel of St. Mark, that appears in the exhibit and the catalogue, but is similar to it. Photos in the catalogue are under copyright protection, so what you see here is a page that the British Library has uploaded and is in the public domain. 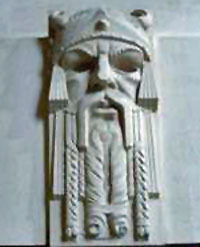 The manuscript has been given Cnut’s name because two records made during his reign were added to the manuscript some time before 1019. One of them was a copy of a writ of King Cnut in Old English confirming earlier grants to the archbishops of Canterbury, and it was included in the exhibit and it appears in the catalogue as well. The catalogue description of The Cnut Gospels, written by Alison Hudson, Project Curator of the exhibition, explains that documents were sometimes copied into sacred books to keep them safe or to indicate that they were under God’s protection. I’d known, vaguely, of this practice, but had never before thought about why it was done, so this was new information. If, like me, you could not make it to London to see the exhibit, consider purchasing the catalogue from the British Library Shop. The beautiful photographs and the in-depth descriptions that accompany them make this book a treasure all by itself. 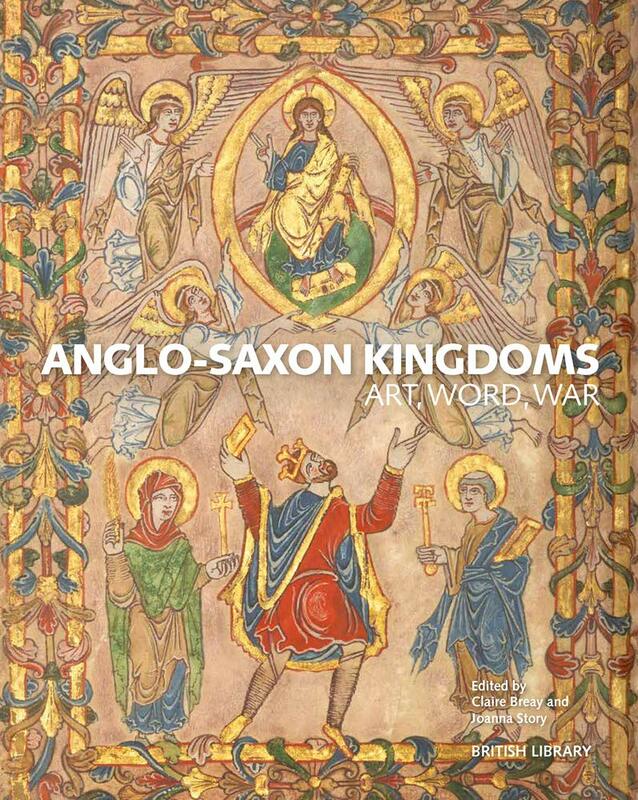 Anglo-Saxon Kingdoms: Art, Word, War. Edited by Claire Breay and Joanna Story. British Library, 2018. “To Uhtred, the true lord of Bebbanburg; a man I have never understood but without whom I would not die a king.” King Alfred in THE LAST KINGDOM. THE LAST KINGDOM is a tv drama based on a series of novels about a hero named Uhtred. It is FICTION set in a historical time and place, peopled with fictional characters like Uhtred, Finan, Sihtric, Brida and Hild, as well as characters based on historical figures such as King Alfred, members of Alfred’s family, and viking warlords like Haesten and Guthred. It frequently dramatizes documented or legendary historical events such as Alfred’s flight into the fens of Somerset or the battles at Ethandun and Benfleet. The dramatic story of Uhtred is set against the backdrop of a much larger story, which is the making of England. We know this much from the words of the novelist, Bernard Cornwell. So, while Uhtred has his own overall goal (to retake his rightful place as lord of Bebbanburg), as well as a number of varied plot goals along the way (to avenge the death of the elder Ragnar, to free Thyra from imprisonment at Dunholm, to rid himself of a curse) he is at the same time caught up in the larger goal that is Alfred’s: the preservation of Wessex and the creation of a single Anglo-Saxon kingdom that will span the island of Britain from the southern coast to the boundary of Alba in the north. Therefore, while Uhtred is the hero of this series, he must interact with historical figures, especially with Alfred. In this Episode 9 of Season Three, their sometimes bitter, occasionally amicable, mostly rancorous long-standing relationship is brought to a moving and satisfying climax. The greater part of this episode is taken up with a face to face meeting between the king and Uhtred. It is beautifully written and superbly acted by Alexander Dreymon and David Dawson. I cannot say enough about David Dawson’s remarkable portrayal of Alfred throughout the series, but his work in this episode is especially powerful. The action in this scene is muted, but both actors convey depths of emotion through their expressions alone: surprise, regret, defiance, fear, doubt, despair, determination, hope, grief. Actress Eliza Butterworth’s fine portrayal of Ælswith as Alfred’s officious, obnoxious wife has made her the harpy that fans love to hate. But her character has always been complex–tender in her sometimes smothering care of her family but inconsistent in her attitude toward Uhtred. Sometimes she hates him and all that he stands for; sometimes she accepts him grudgingly as a necessary evil. Sometimes she has even urged the king to trust him; but not this time. Still, her unwelcome interruption serves to move the action further forward, leading to a glance of mutual understanding between the two men; to Alfred’s defense of his wife, “She is angry that I am dying”; to Alfred’s plea that Uhtred protect Edward; and to the pardon he gives to Uhtred that, for the first time, has no strings attached. At the end of that scene I was watching with tear-filled eyes. It appears that Episode 10 has a lot of ground to cover. Surely I am not the only one who, upon hearing this, sat up abruptly and thought, REALLY??? His MIND, maybe. But his HEART? There is a royal wedding about to take place in Wessex, and in this episode screenwriter Stephen Butchard explores the rather fraught marital—and in the case of Uhtred and Skade, extra-marital—relationships of his characters, beginning with our hero and the witch. Uhtred appears to be a man obsessed with his woman. On shipboard after snatching Skade from Haesten, Uhtred wakens to find Skade holding a knife above him. (Excuse me? After what she did to Bloodhair, who left them alone together with Uhtred asleep and Skade holding a knife? Yikes!) But Skade merely slices her palm and allows Uhtred to lick blood from her fingers as she foretells his victory over a dying Alfred. Finan watches, worried, from a distance. Presumably Uhtred is sleeping with Skade, although we don’t see it. At Cookham he tells Hild, “Who I bed is no business of an abbess,” and later “A man needs a woman.” Finan observes, “A GOOD woman,” and calls Skade the Devil. Finan and Osferth are both worried about Uhtred’s liaison with Skade, and all the men fear her. As well, they should. She is cruel, unpredictable and dangerous. She’s like a venomous serpent–beautiful, quick to strike and deadly. The monkish Osferth wants to know why the evil woman isn’t dead yet and Finan is clearly of the same opinion. Nevertheless, Finan goes to Winchester on Uhtred’s orders, although he’s uneasy leaving Uhtred behind in Cookham with Skade. Now, in THE BURNING LAND, a maddened and raging Skade meets her end coiled atop a heap of treasure like a dragon, lovingly embraced by Bloodhair as he sinks his knife into her belly. But in the show Bloodhair is already dead, and Brida has said that in order to break Skade’s curse Uhtred must kill her without shedding blood or breaking the skin. So when we see Skade waist deep in a mere and Uhtred wading in to join her, anyone who has been paying attention is pretty sure about what’s going to happen next. Skade (Thea Sophi Loch Naess) and Uhtred (Alexander Dreymon) in a tender, watery moment. Skade, though, has not been paying attention. As Uhtred embraces her she gloats, “I own you.” They are the final words of a woman who talked way too much. Uhtred acts to rid himself of Skade’s curse. It’s not punishment for her deeds; it’s not anger; it’s purely self-preservation. The scene that follows, between Uhtred and Osferth, reveals how shaken he is by what he’s done. Also, it’s a nice touch to have Uhtred, who has been putting on an act about Skade, to enter Winchester with a band of players. Next we look in on Æthelred and Æthelflaed as they arrive in Winchester for the royal wedding. He’s taunting her. She’s nagging him. All is not well between the Lord and Lady of Mercia, but this is nothing new. Meantime, Aldhelm is watching, and I am wondering what is going to happen with him. In the novel he is Æthelred’s unapologetic, loyal hound and already dead at Uhtred’s hands by this time. Here he seems to be going in another, more sympathetic direction, loyal to Mercia, and one has to wonder where that might lead. Even Beocca and Thyra, who adore each other, are having a bumpy ride in this episode thanks to Uhtred. He needs her blood to send Ragnar to Valhalla, and she happily agrees. Beocca, as we would expect, is outraged because he sees it as a disgusting pagan ritual. He storms out of the house wanting no part of what they’re doing. But despite his fear for his wife and his anger at Uhtred, Beocca immediately becomes their defender against Æthelwold’s gang of thugs and then goes to the king to plead with him on Uhtred’s behalf. Of course, he does walk perilously close to danger’s edge when he informs the king that the outlawed Uhtred is in Winchester and “You can have him found and executed, or you can speak with him.” We do not know yet how that interview will go, but the final image, of Alfred watching Uhtred from the shadows, is chilling. The couple that gets the most attention, though, is the royal pair: Alfred and Ælswith. Even when they agree, they disagree–take Æthelwold for example. Alfred says he should be watched. Ælswith says he should be dead. 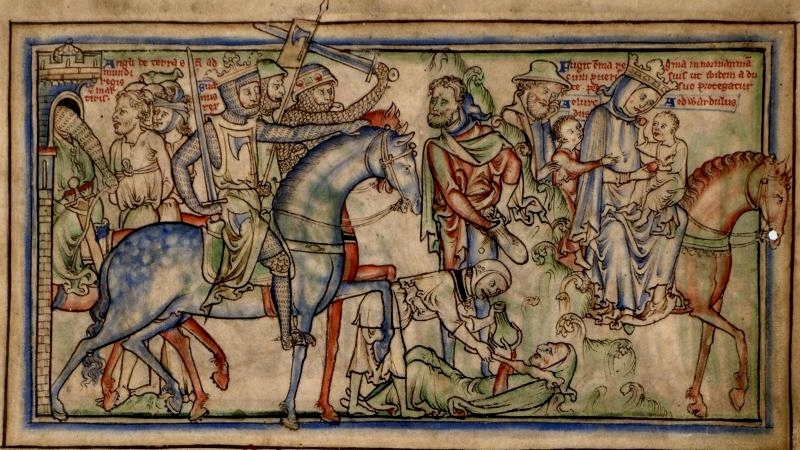 They are constantly wrangling—over Æthelwold, over Edward, over whether the ailing Alfred should even be standing upright, but mostly over Uhtred. Alfred’s insistence that when he is gone Edward will need Uhtred at his side is a bitter pill for her to swallow. It’s interesting to consider the women in this episode—Æthelflaed the Lady of Mercia; Brida the Danish war leader; Ælswith the wife of the Wessex king; and Skade the sorceress—because all of them act with agency. Not Edward’s betrothed, alas. She is very young and totally under Daddy’s thumb. Look at Æthelflaed, who has gone from ASKING Uhtred for help to commanding him. “You will walk with me. That’s an order.” And on that walk, when they are attacked by men led by Offa, Æthelfled is the one who tells Uhtred, “We split up,” and takes out two of the assassins. Alexander Dreymon as Uhtred & Millie Brady as Aethelflaed. She’s holding a knife, honest. Uhtred takes out the other two, including this thug, a cameo appearance by author Bernard Cornwell. Later she crosses verbal swords with her bladderwrack of a husband, and there is the hint of a political alliance forming between Æthelflaed and Aldhelm, who has lost all respect for the bladderwrack. Hopefully, Æthelflaed has learned not to trust anyone completely, except for Uhtred. 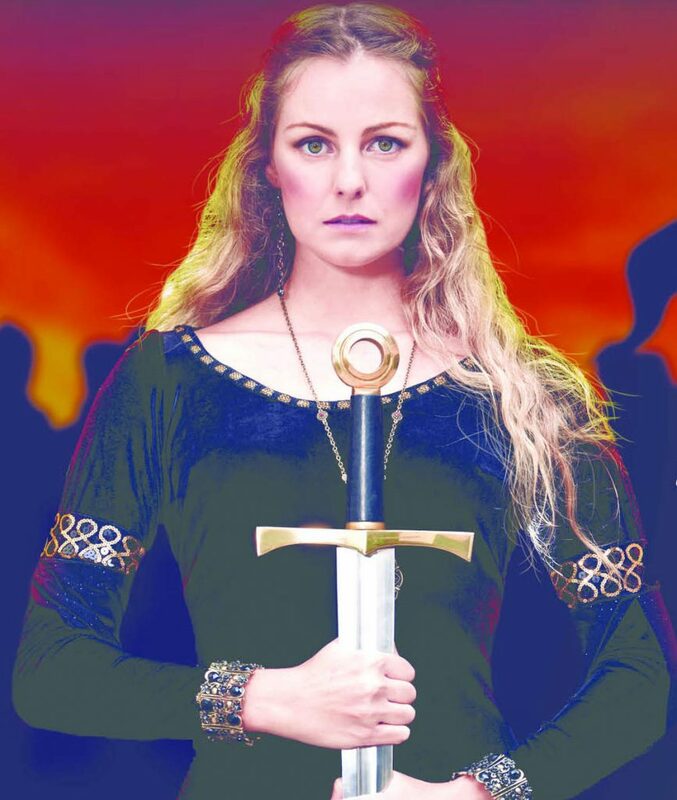 She is, though, fast becoming the Æthelflaed who will one day lead armies against the Danes. Brida is hanging out at the Danish camp with the viking warlords, just one of the guys; but she’s disgusted by their incessant quarreling over who has the rights to Skade. “She has you all by the balls. Believe it.” Ragnar’s men now follow her, and she accepts Cnut’s suggestion that they form an alliance in order to combine their forces. If Cnut was looking for sweet words from his new woman, he must have been disappointed. Brida is tough as nails and all business; and we can’t forget that she must suspect that one of this gang murdered Ragnar, and that she needs to find out which one. And we already know that Brida is capable of murder when she thinks it’s deserved or necessary. Lady Ælswith, when she’s not telling Edward to stop fidgeting or to stand up straight, is Alfred’s chief counselor. 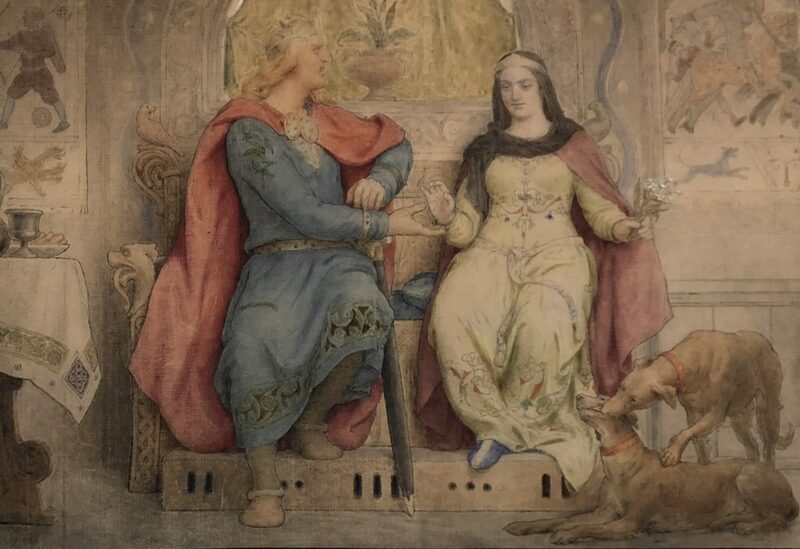 She may not have the title of QUEEN—the West Saxons avoided honoring women with that title, QUEEN, until the mid-10th century because they had a bad experience with a queen once—but she is always at Alfred’s side. At the Witan sessions, in negotiations over Edward’s marriage, during Æthelwold’s trial, and in Alfred’s moments of doubt she is right there in a place of high honor. Timothy Innes as Edward, David Dawson as King Alfred, Eliza Butterworth as Aelswith. Whatever we may think of Ælswith—and sometimes I want to slap her because she is so prudish and such an enemy of Uhtred, she is a woman of her time and place who adores her husband. She foists her opinions on Alfred, and occasionally he listens. Frequently he does not follow her advice, but that doesn’t stop her giving it. And woe to anyone who she deems a threat to her family. Did you see her face when she thought that Alfred was going to pardon Æthelwold? And when her nephew is screaming under the hands of the torturer, there is only one person among the onlookers who is smiling: Ælswith. And then there is Skade who has some kind of mystical power over men so that they fear her. Never mind that her prophecies don’t come true, they still believe she has some unearthly power, and she is certainly liberal with her curses. Sihtric says that she is poison to all men, and it’s hard to disagree. Speaking of poison, she helps Bloodhair during his weird preparation for his battle to the death against Haesten, and although I could see that she was indifferent to Bloodhair, I didn’t realize until later what she was actually doing. It’s hard to understand the motivation behind her action, other than revenge because Bloodhair abandoned her, and the fact that Skade is a merciless, depraved monster who is fond of blood, blood-letting, blood-spilling, blood-drinking, etc. At the end of the episode she is all Uhtred’s, and I wanted to gag when he kissed her. Note to Uhtred: keep all weapons, like knives, well out of Skade’s reach. And don’t lick her fingers.